Flower delivery in Bangkok and all Thailand by the florist network in Thailand. ChangFlorist.com is Thailand's nationwide florist network, with a huge network of local business connections bringing flowers and gifts to all areas of the country. Our highly-skilled professional florists and delivery teams have the knowledge and experience to achieve excellence - whatever your requirements or special occasion. Our close working relationship with our nationwide network of expert florists ensures the highest standards of design and presentation. We are ready 7 days a week to deliver wonderful professionally-designed flowers and gift ideas. If you need to impress someone in Thailand with flowers or gifts, ChangFlorist.com is the reliable and professional solution: we are ready to serve you and take care of your order quickly and efficiently. 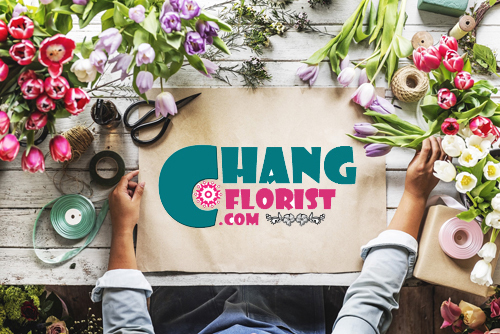 Chang Florists delivers all flowers and gifts ordered through our vast network of local Thai Florists, to all Thailand provinces. This includes the major centres such as, Bangkok, Pattaya, Phuket, Chiang Mai, Samui, Khon Kaen and Udon Thani. Chang Florist also delivers to the remote Issan cities as well. We offer same-day flower delivery if required - this is guaranteed for orders placed before 3.00pm Thai time. We never forget that you are our valued customer. You can be confident that once you have placed your order, you will receive premium-grade service: the delivery will be accurate and of the best quality. Our promise to each customer is simple: complete satisfaction. We guarantee that every flower selected will be only fresh A-grade quality. We mostly use fresh-cut flowers from local garden farms - an important reason why you should choose Changflorist.com for all your flower deliveries. The recipient is guaranteed to receive a fresh and beautiful gift of flowers. We guarantee that the whole gift or flower package you choose is selected for modern and stylish quality - we want your recipient to be delighted with their gift. We guarantee the recipient will get flowers or gifts on the specified date, and we also guarantee same-day delivery for orders placed before 3.00pm in the recipient's time zone. We guarantee the flowers and gifts will reach the recipient at the name and address that you have supplied to us, and we also guarantee the flowers will still be as fresh and beautiful as if they had just come from the garden. We cannot guarantee an exact delivery time, especially at peak periods, but we guarantee that we will deliver to the recipient on the specified date. Our highly-skilled professional florists in Bangkok and delivery teams in Bangkok have the knowledge and experience to achieve excellence - whatever your requirements or special occasion. Our close working relationship with our expert florists in Bangkok ensures the highest standards of design and presentation. Our Bangkok florists are ready 7 days a week including the public holiday to deliver wonderful professionally-designed flowers and gift ideas in Bangkok. If you need to impress someone in Bangkok Thailand with flowers or gifts, ChangFlorist.com and our Bangkok Florists are the reliable and professional solution: we are ready to serve you and take care of your order quickly and efficiently. Our Bangkok Florists provide the flowers delivery service to all areas and all place in Bangkok. Our florists in Bangkok usually deliver the beatiful flowers and gifts to the recipient at the work places, hotels, hospitals, restaurants, pubs, bars, the villages, condo, apartment and many more regarding to the request of customer. Our main Bangkok flower shops are base in the downtown areas and business area of Bangkok (Sukhumvit area). So, after our Bangkok Florist has received the customer order of flowers or gift delivery, we can provide the delivery to the recipient at the offices, hotels, condos, hospitals, restaurants, pubs, bars and more in Bangkok fast and efficiently. The following are the areas of Bangkok that we provide the flowers and gifts delivery. Popular areas for flowers delivery to Bangkok. "Sukhumvit Road, Sukhumvit areas, Soi NaNa, Soi Cowboy, Silom Road, Patpong, Soi Ari, Khao San Road"
We provide the flowers delivery to all districts of Bangkok and the following is the list of districts in Bangkok.